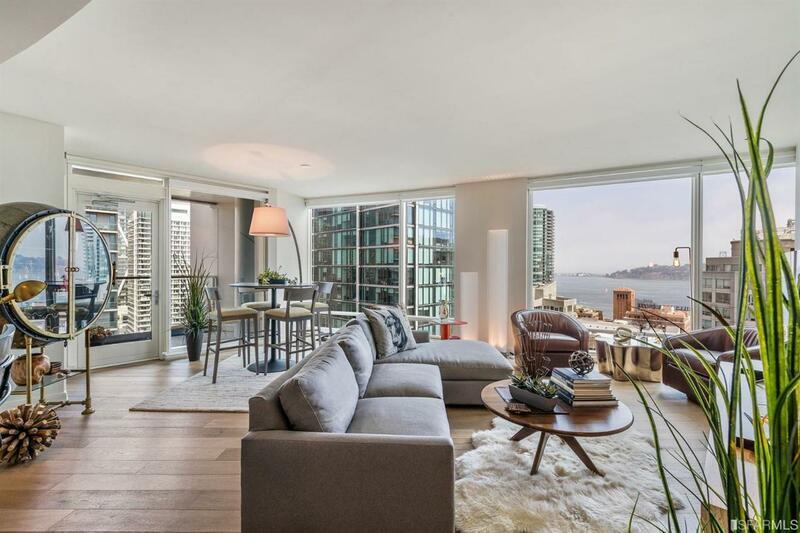 Spectacularly appointed residence atop Rincon Hill in the new East Cut neighborhood with Bay, City and Bay Bridge views. Located within 2 blocks of The Embarcadero, San Francisco's newly debuted Sales Force Park & Transit Center as well as the entire Social Media & Tech Hub. Residence interiors as well as The Harrison's Grand Salon and the 49th Floor Uncle Harry's sky lounge were personally curated by acclaimed designer Ken Fulk. Studio Becker Ash Molina cabinetry, Carrara marble counter tops & Waterworks brass fixtures in kitchen & bathrooms set The Harrison apart from any other building in San Francisco. Stunning diagonal plank Siberian oak wood floors in kitchen, hallways, living room and dining areas. Seller open to selling furnished. Builder Architect Webcor/Solomon Cordwell Buenz & Assoc. Cross Street Address Fremont St. Listing provided courtesy of Rob Bryan of Gpk Luxury Real Estate. © 2019 San Francisco Association of REALTORS® Multiple Listing Service. All rights reserved. Listings on this page identified as belonging to another listing firm are based upon data obtained from the SFAR MLS, which data is copyrighted by the San Francisco Association of REALTORS®, but is not warranted. IDX information is provided exclusively for consumers' personal, non-commercial use and may not be used for any purpose other than to identify prospective properties consumers may be interested in purchasing. Information is deemed reliable but is not guaranteed accurate by the MLS or Keller Williams San Francisco. Data last updated 2019-04-22T22:19:43.967.